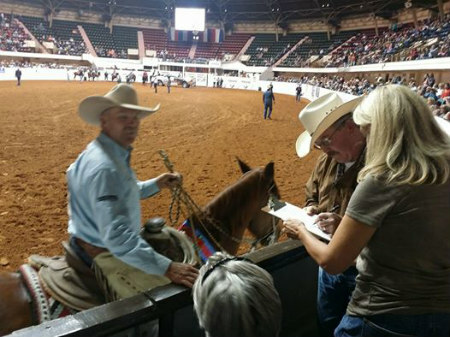 There are certainties in this life which are as constant as the Laws of Physics, and if you run a ranch, here is one to add right behind the Law of Gravity - Do not ever attend an horse auction after you have just picked up a cattle sale check. Because something killed a calf last week, we decided to sell off some of the youngest bull calves and a cow/calf pair. The calf was too young to wean, and her mother is a crackhead so whatever killed the first calf, be it the cougar or the coyotes, it would certainly be back for this one. We might as well sell the pair before we lost the calf. Yes, Paisley fans, say B-Bye to the Crackhead! That's a burr out of my saddlepad. After years of listening to me argue about selling that headache, Other Half finally agreed. I think it had something to do with staring at the carcass of nice heifer calf belonging to the best mother on our place. Paisley's calf didn't stand a chance. She's a nice cow who produces nice babies but she needs to be on a ranch with no water gaps and fewer predators. You may also be as surprised as I was to learn that the buyer saw Paisley riding in the trailer with the calves and followed us right back to unloading dock where he checked her out, asked some questions, then walked right into the building and bought her. Paisley wasn't at the sale barn for 30 minutes before she and her calf were on their way to Oklahoma. Alrightie then. There's another chapter passed. So back to the horse sale. We took a break from building fence because Dear Friends Kim & Clyde had bought us tickets to the Extreme Mustang Makeover in Fort Worth. We'd always wanted to see this event where top trainers around the country take Bureau of Land Management Mustangs for 100 days of training. After that time there is a competition to show off their new skills, and the horses are auctioned off to adopters. We almost didn't go. I still have acres and acres of field fence to string, and stalls to put up, but instead we opted to take a break and enjoy the evening with friends. Dear Friend Kim has proudly accepted all blame and accolades for the results. On the way there we stopped by the post office and lo and behold, the check from the sale of the calves was in. Now ordinary people wouldn't be concerned about this, but in the back of my head, I was watching the dominoes line up. We get settled and watch the event. It is truly amazing that these horses were running wild earlier. Not only is the event a display of the mustang versatility, but it showcases some of the finest trainers in the country. Ordinary people would just sit back and enjoy the evening, but my husband had a pocket full of money and so I was a bit edgy. The evening unrolled as expected, long concession lines, crowds of people eager to see the show. The horses were really nice. Although there were some bobbles that can be expected at any horse show, they were well-started and the talents of both the horses and the trainers showed well. Some were cute. A couple of horses I would have taken home except for the fact that I already have two riding horses and have been thinking of stealing Other Half's cow horse. Buying a mustang was tempting, but I don't need another horse. And then. The big red horse rode out. Dear Friend Kim had told me about this giant red horse named Tiny. His trainer, Tom Hagwood, is something of a legend, and it didn't take long to figure out why. The other horses were good, but this big red horse was something else. Wow. He wasn't flashy, he was correct. Big long John Wayne strides of correct. I liked him even before he started working the calf. And as soon as the horse saw that calf, he readied himself and got to work. I glanced at Other Half and knew that look. As soon as the horse was finished, he nodded his head and said, "I want that horse." Dear Friend Kim couldn't point him to a buyer's number fast enough. I was daring to be a bit excited. We needed another cow horse. 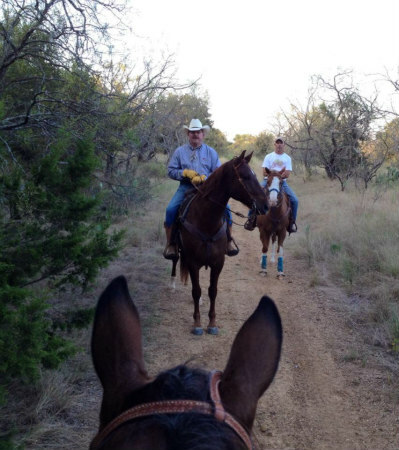 One cowpony and some border collies just can't do it, and the country is too rough to do everything on 4-wheelers. That big red horse would be a lot of help around here, and Other Half was ready with a pocket full of money and buyer's number. 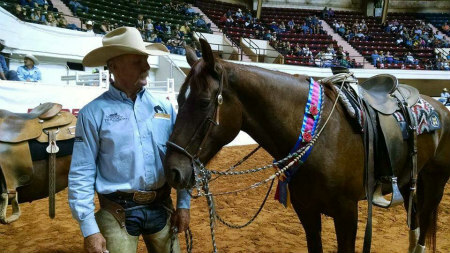 But then, the expected happened - Tiny and Tom Hagwood won 1st place and $20,000. I was happy for them, but sad for us. We wanted him, we needed him, but I looked at that first place ranking and decided that someone with more calf money was about to outbid us. Other Half is never one to let the odds get him down, so during the short meet & greet where the trainers ride along the rails and talk to fans and prospective buyers, he talked with Tom about Tiny. After the talk he was even more convinced that Tiny was the horse for our ranch. I was too, but that whole pesky thing about money kept rearing its head. We are just simple ranchers. We don't have big pockets. We have lots of wild country, wild hogs, and constant fence repairs. The bidding began and Other Half jumped right in. As the bidding climbed, he kept looking at me for approval. Should he keep bidding? Like him, I knew that big horse could be exactly what we needed. A few confused minutes later, it was done. Tiny was ours. That's when the real confusion began. We had just bought the winner of the Extreme Mustang Makeover and suddenly I had my doubts. We just wanted a cowhorse. This horse and his trainer were celebrities. We went back to the stalls and I was overwhelmed. Friends and fans crowded in to congratulate Tom and Tiny and I wondered if perhaps this horse was destined for more than a life with us as a simple cowpony. He would be loved but there isn't much flash around here, just beautiful sunrises, beautiful sunsets, and lots of work in between. We picked him up the next morning and that's when I fully appreciated how big Tiny was. Tiny towers over the other horses. On the way home we stopped by our farrier's to pull off his sliding shoes. Shoes like that aren't useful in heavy brush and can be dangerous. We're missing a band of 6 cows and so, as is typical around here, there is no rest for the weary. 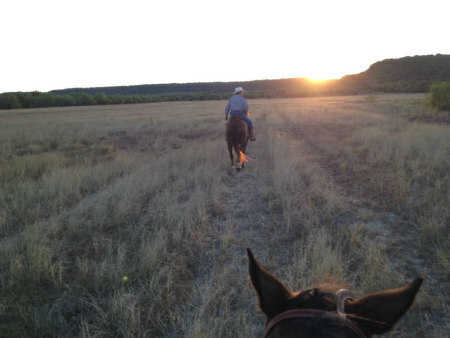 Along with our farrier, and Dear Friends Kim & Clyde, Tiny saddled up to hunt for cows. There was no honeymoon for Other Half and Tiny. No easing into a relationship. Off to work they rode. We joined up later in the brush and he was gushing praises about the big red horse. Tiny went anywhere he was pointed and through anything. The John Wayne horse was proving himself to be a honest and willing worker. 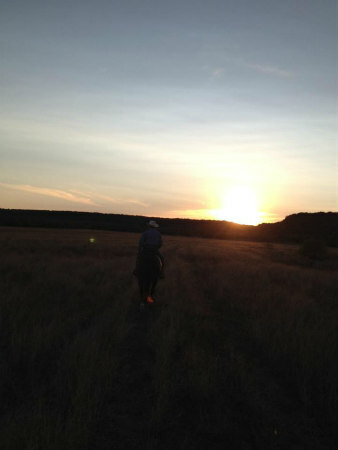 As we rode back to the house Other Half turned around in the saddle and said, "I think I finally found my Skip again." Ahhhh.... the elusive Skip horse. He'd had that Skipper W bred gelding for almost 25 years. There are horses, and then there are partners. Skip was a partner. After his death Skip has been hard to replace. Other Half has looked for the last eight years for a horse that could fill that void. I watched him work with the big red horse and like Other Half, I thought of Skip too. And I was able to sort out my thoughts about buying a celebrity. Tom Hagwood wanted the horse to go to a working home. Tiny is a working horse. It fits him. He fits us. From the wilds of Oregon, to the BLM pens in Nebraska, to the trainer in Wyoming, and then here to Texas, Tiny's journey has brought him home to us. I'm one of Tom and Tiny's fans that have followed their journey on FB. This ending/beginning brought tears to my eyes, so wonderful to know that he will be that special horse for your husband! Thank you for sharing! Your post brought tears to my eyes.... Tom is a friend of ours and I know how much these horses mean to him. He bought back the last two! It's so good to hear that Tiny has found more than a home with you--he has found a family who will use him for what God (with a little help from Tom) made him to do. Congrats on your new top hand...i never got the chance to meet Tiny, but I know Tom's work well! It sounds like you and Tiny and Tom were all winners! I cried! The Hagwoods are dear friends and have stayed with us before each of the last three mustang makeovers. 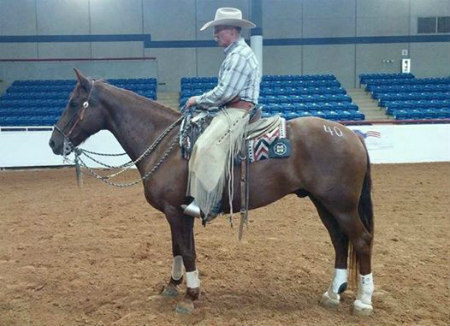 We got to see Tiny work several times before the competition began and knew he was a cowhorse who needed a ranch job! Thank you folks and the Lord for such a wonderful confluence of events to bring Tiny home to you and settle your hearts about Skip! I just wanted to Thank You for taking the time to write this about your experience with Tiny. I own and train mustangs, and love hearing the new owners perspective. I think I speak for lots of trainers when I say we would much rather our horses go to places where they are used and have a job. I truly think these horses are happiest when they feel they have a purpose. Thank you so much for giving our mustangs a try and a home! Thank you so much for sharing the beginning of your life with Tiny! I am one of Tom and Tiny's many followers, and even rode in a parade with the pair a few months ago. I wish your OH many happy years together! Congratulations, what an honor to buy the "big red horse that Tom Hagwood trained".. I know this will be one of the best buys you ever made. I wish you and Tiny the best of luck... Happy trails to you. I can't imagine a more perfect home!! Congratulations on a great horse!! Glad Tiny gets to do what Tiny is good at and with people who will love him and give him a great job!! Was an honor getting to see Tom win for a 3rd time! Congrats on a good horse! Loved reading your story. Congratulations on getting Tiny, I loved watching him work a cow and I think he is going to make you a heck of a working ranch cowhorse! Great story, and I'm glad that big boy has a job. I've been following his progress and that of several other great horses that were in that same competition, on a Facebook group for 3 months. I'm glad you found a working horse that can perhaps fill that void left by your beloved Skip many years ago. I think this big boy is going to look forwards to the chance to learn and work. You for sure spent a lot of money, but time will probably prove it to be well spent money. wow, thanks so much for sharing! MANY of us watch these horses from the time the trainers bring them home, then they go to auction and we just never know how they are, or what they're doing. So glad Tiny is a "fit". Mustangs are crazy smart, and eager to please. . . so very happy when one finds a forever home with good people who can encourage that, and grow with it. Crazy story! I don't know how I came across this blog but I was sitting in the same area as you guys and watched the whole bidding war! Congrats on getting that beautiful big boy! Neat! Isn't Tiny pretty big for a mustang? I saw that he was "only" the third-high selling in the sale. The other two may be flashier (just a guess) but Tiny found just the working ranch he needs. 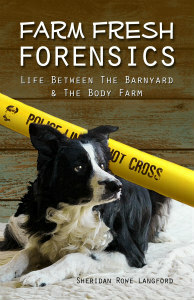 Paisley helped give you one last remembrance of her, but a good one this time. It is always such a cool thing when you get to meet a reincarnated "old flame".